Becclebee, from marjoryjane, invited me toone of her regular crafternoons last weekend. While there, she was crocheting very interesting things. 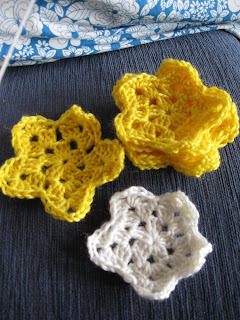 So interesting, infact, that I abandoned the pre-prepared craft I had bought along and jumped instead on the crocheting band wagon. 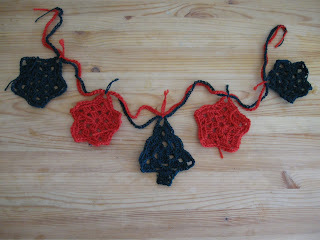 She, and now I, have been busy crocheting stars using the wonderful Royal Sisters star pattern. The tighter, smaller ones are Becclebee’s. Just like knitting, I crochet looser than she does. At the top of the photo is the pretty 70s crafting dress I was wearing at the time. I’m such a fan of the blue-and-white colour scheme in clothing. If you haven’t been over to The Royal Sisters, do pop along to bathe in some of her cheerful granny goodness.